Every Friday, we’ll be bringing you reviews of meaningful comics found in the collections of our writers. “Long Box” refers to the lengthy, white cardboard boxes most comics find themselves stored within – bagged, alphabetized and numerically ordered. It’s 1938 and while New York City’s young and rich are enamored with the new sounds coming out of the late-night jazz and swing clubs, the rest of the country sweeps up the remaining pieces of their lives left behind by the great depression. Prohibition has ended but a dark cloud of war looms over the eastern horizon that reaches all the way to the shores of America’s largest city. Amidst it all, the gangsters and debutantes, law men and politicians, sports players and musicians, the malevolent criminal, known as the Tarantula, silently stalks his prey and it’s up to the Sandman to stop his homicidal wrath. I started reading Sandman Mystery Theatre because it was an offshoot of the Neil Gaiman penned, award-winning (and quite famous) Sandman series. The two title characters share little in common with each other except for a rudimentary sub-plot that is more of a marketing exercise than any literary decsion. This Sandman is the golden-age Sandman – the one that came first – the one that was, back in the late thirties, a founding member of the Justice Society of America. Of course, his look had been updated, a trend in comics that seems to cross generations and never quite goes out of date. Gone is the yellow and green costume, replaced by pulp-inspired leather gloves, trench coat, fedora and World War I gas mask. 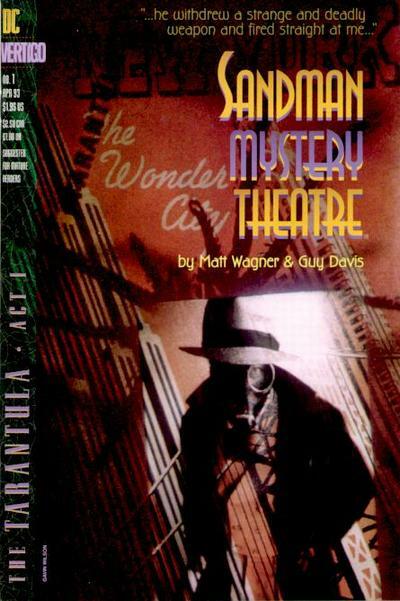 That said, being a fan of Gaiman’s Sandman had a lot to do with why I started reading Sandman Mystery Theatre. At the time, I was also looking for some dark, brooding mystery stories to read. I found it in spades with this title. It helped that Matt Wagner, acclaimed writer and artist of Grendel and Mage was also at the helm. With the final volume of Neil Gaiman’s Sandman series just collected in an Absolute edition, I thought it might be a good time to look at, and re-evaluate, its noirish spin-off. Under the auspices of Editor Karen Berger who, arguably, built the Vertigo brand for DC Comics and the talent of Matt Wagner, Sandman Mystery Theatre would see storylines run in multiple issue increments with a new artist attached to each new storyline. Guy Davis would return more often than not, however, as his distinctive illustration style would give Sandman Mystery Theatre the look and feel that would make it both timeless and successful. Wagner gives his story abundant detail and atmosphere, placing the comic squarely in a real time and locale, immersing the reader fully. The first arc, entitled The Tarantula, sets the stage for the world in which the characters interact – New York, circa 1938. Famous people like Joltin’ Joe DiMaggio, Tallulah Bankhead and Bugsy Siegel make appearance here. Alcohol, and it’s recently rescinded prohibition, is referenced and there is more than one passing remark about the state of organized crime. Characterization is everything in the series. Wesley Dodds is a pleasant, stoic, yet introverted man of wealth, recently arrived to New York from abroad, who harbors the secret that his alter ego is the crime-fighting Sandman. Dian Belmont is the beautiful and gregarious daughter of the city’s District Attorney. A recent college graduate, Belmont carouses in the fast lanes of night clubs, her curious nature getting both her and her friends in a whole host of troubles. There are others as well: retired Judge Thomas Schaffer who wishes he was still on the bench and movie mogul Albert Goldman whose dealings with organized crime are no less interesting than the dealings within his own family circle. Wagner’s penchant for characterization does not slow the pace of the story in the least. There is action here, too. And intrigue. Guy Davis’ art supports the story in the best of ways. He has obviously researched the time period extensively, from architecture to dress attire. Every locale appears different making New York look truly expansive while every character is drawn with a distinctive sense of style and physical attributes. In fact, Davis goes against the grain, drawing the main characters of Dodds and Belmont as slightly overweight, more Rubenesque examples of a hero and heroine. Sandman Mystery Theatre is stronger for that artistic decision. His line work is precise. Fine and sometimes scratchy ink lines evoke emotion, ambiance and atmosphere. His panels tell stories themselves, supporting, never interfering with Wagner’s words. Sandman Mystery Theatre ran for seventy monthly issues and an annual between 1993 and 1996 – a healthy run. Various specials and mini-series have also been produced since then featuring Wesley Dodds as well as another, more modern update on the character. The series demonstrated that genre stories could sell well, if done properly, in the maturing comic book market and it proved to be a feather in the cap of Wagner and Davis, editor Karen Berger, Vertigo and their parent company, arguable setting the stage for the number of creator-owned, genre-bounding titles the publisher produces today. The Sandman may have seen a number of changes over the past seven decades but in the hands of strong writers and artists, the character has found a way to remain interesting to audiences, never dying and, indeed, never tiring. DC Comics has, for some time, been collecting the series in trade paperback form. If you’re keen to read a noirish-mystery with fully-fleshed characters and strong story-telling and art, I would highly recommend it. No time for sleep, the golden-age Sandman is as active today as he ever has been.